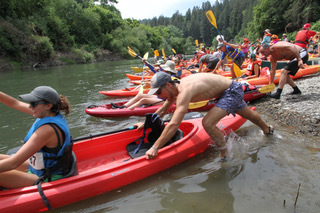 The Great Russian River Race, May 4th, is opening day for the summer season on the beautiful Russian River. Recreational kayaks, canoes (individuals and teams) and SUP’s will do battle in the 5-mile Rio Lindo Race, starting north of Healdsburg. This year we will be opening the Race to racers or family teams to youth over 5 years of age so the whole family can get on the River. Race proceeds will support planning work for more river access and trails! If you’ve been to the Great Russian River Race before – you know the biggest competition for first place is for the Costume Contest so be creative and you might win a prize for Best Individual Costume, Best Pairs Costume, Best large Group Costumes (over 6 racers) and Best Youth Costume for racers under 18. For more details on the race, click over to the registration page. Please indicate your team name and category on the Registration Page. PERSONAL FLOATATION DEVICES (PFD’S) ARE MANDATORY TO PADDLE ON THE RIVER. They are included with your boat rental. If bringing your own boat, bring your own PFD.